First, it’s great to be here at Archbishop Spalding High School on such a great occasion. I’m delighted to be here to help you get the new school year off to a great start; to bless this beautifully expanded and renovated auditorium; to join you in thanking your President, Kathleen Maher, and your principal, Lewis Van Wambeke, for their leadership; to join you in thanking the board, faculty, and staff here at Spalding; and with you to thank your parents for making the sacrifice to send you here. And let’s also show our gratitude to the donors who made possible these tremendous improvements in your wonderful school! This is a great school designed to give you a great future. I should tell you that have one thing in common with Archbishop Spalding – I don’t mean the school but Archbishop Spalding himself. I attended the same school that Archbishop Spalding attended, St. Mary’s College near Bardstown, Kentucky. We weren’t classmates! He went there for college shortly after the school opened in 1821 and I was there for high school back in the late 1960’s. 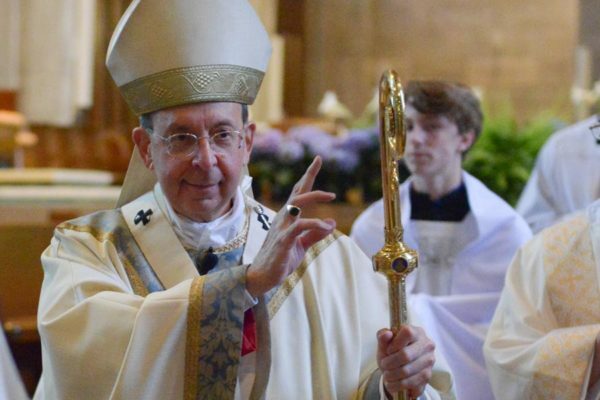 Archbishop Spalding’s family was originally from Southern Maryland and emigrated through the Cumberland Gap, winding up in central Kentucky, along with many Southern Maryland families. As you know Archbishop Spalding served as Archbishop of Baltimore during and right after the Civil War and he championed the abolition of slavery and the cause of those who had been freed. Had he lived a little longer, he likely would have been the first U.S. Cardinal. 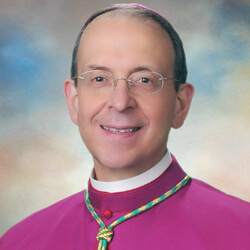 You should be very proud of the Archbishop after whom your school is named! In the Gospel we read about fishing. You know Peter and the other apostles were what we’d call today “commercial fishermen”. They knew what they were doing. But as the Gospel story opens, we find they weren’t having much luck. They worked the whole night long and caught nothing. Here’s one thing this Gospel is NOT teaching us – It’s not teaching us to use Jesus as a substitute for our own efforts. So, let’s say you’re having trouble with algebra or chemistry or any other subject – maybe you’re getting ready for an exam and in spite of your hard work, you’re just not getting the hang of it. This Gospel is not teaching you to snap your fingers and ask Jesus magically to help you meet the challenge. Jesus didn’t help Peter catch fish because he wanted to help Peter be a successful commercial fisherman. Jesus helped Peter catch all those fish because he wanted to make a point – from that moment onward Peter & the other apostles would be doing the Lord’s work, namely, attracting other people to Jesus and to the Gospel. Here at Archbishop Spalding you have the opportunity to develop your talents. It’s a place where they don’t just hand you a fish, they teach you how to fish. You are challenged, taught, and formed to develop your God-given talents and to put them to the test – in the classroom, in this auditorium, on the field, in service to one another and to others, in various social settings, and much more. You’re gaining a lot of knowledge and acquiring a lot of skills and in the process you’ve begun to think about how to further your education and maybe you’ve even thought ahead to a future career. Have a great year in this great school.